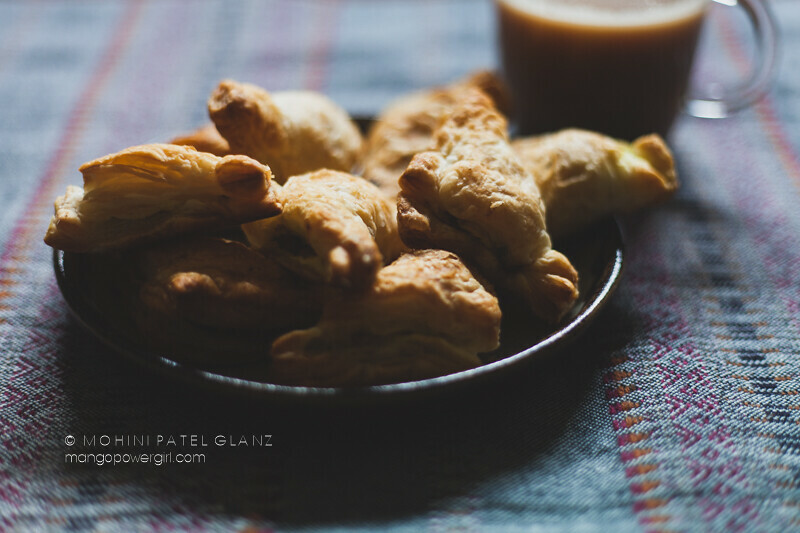 The first time I came across frozen puff pastry in a grocery store, this is what I made with it — Baked Samosa Puffs! I turned my mom’s traditional, fried samosa recipe into an easy, baked samosa. It saves hours of work and the torture of frying (and if you know this blog and me, you know I don’t like to fry!). Baking also makes variations easier; I almost never make samosas the same way twice. I’ve made them with sweet potatoes, corn, mushrooms, squash, paneer… in more ways then I can remember. You can find my basic Baked Samosa Puffs recipe at KCTS9.org. KCTS 9 is our local PBS station, serving Washington state and Canada. Below Recipe and post was originally published at kcts9 website. You can make delicious Indian food at home without spending hours in the kitchen, if you choose your dishes wisely and know a few tricks. Samosas are probably the most popular Indian appetizer of all time, but most people won’t make them at home because traditionally, they require making a difficult pastry dough and then deep frying. 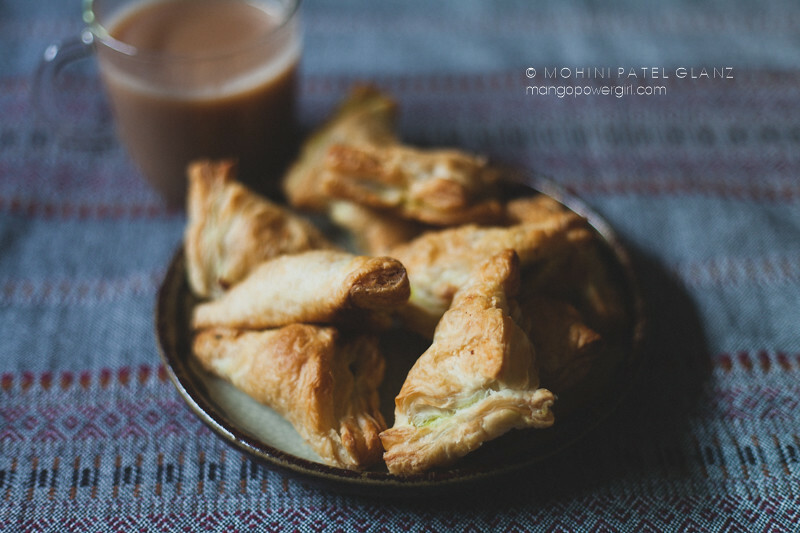 There is an easier and healthier alternative: baking your samosas in puff pastry. This recipe is even better if you can use a frozen pastry from Seattle’s Aussie Bakery, which has fewer unnecessary ingredients than most puff pastries. It’s also vegan, which conveniently makes this entire recipe vegan. One more thing about this recipe: it’s easy to customize to your liking. Stick with the potatoes and spices for a basic samosa, then try adding vegetables such as mushrooms, cauliflower, or corn—and add one hot, green chili if you like it spicy! 1. Thaw the puff pastry by putting it in the refrigerator the night before you plan to use it. I like thawing this way, as it doesn’t get sticky and stays ready to use. 2. In a nonstick pan, heat up the olive oil on medium heat. 3. Once the oil is hot, add cumin seeds and temper for a minute or two, until fragrant. 4. Add onions, ginger, carrots, and let the mixture cook till onions are translucent. 5. Add potatoes, salt, and garam masala, and stir. Cover and cook for 10 minutes, while stirring a couple times in the middle, so the potatoes don’t stick to the pan. 6. Uncover and finish cooking on low medium heat, so the potatoes are cooked, but not mushy, and have some color and crispness. 7. After 7-10 minutes cooking uncovered, check potatoes in the middle to make sure they are cooked through. 8. Add peas, mango powder, and cilantro; stir and cook for 5 more minutes. 9. Taste and adjust seasoning if needed. Turn the heat off and let the mixture cool to room temperature before preparing to fill the pastry. 10. Preheat your oven to 400F or according to the directions on your pastry box. 11. Unroll one pastry sheet on a lightly floured surface and roll it out a bit with a rolling pin so you can get even squares, about 12 from one sheet. This way, you get a few more samosas from the sheet and they don’t puff up too much. 12. Cut the pastry into squares. You can make a few big ones or a whole bunch of small, bite-sized ones. 13. Depending on how big your squares are, fill them with about a tablespoon or more of filling. You want to leave enough room to seal the pastry without the mixture falling out, and without stretching the pastry too much. 14. Take one pair of opposite corners and fold into a triangle. Press and crimp the edges by hand or with a fork, and lay the pastries out on your baking sheet. I like using the darkest of my baking sheets without parchment, as the pastry cooks faster and crisps nicely. 15. Bake for about 20 minutes, rotating the pan half way through, or according to the directions on your pastry box. Bake until the tops are crispy and golden. Baking times will vary based on the size of your samosas. Small samosas will bake quickly, so keep an eye on them. 16. Serve right away with your favorite chutney, or ketchup, or a hot cup of chai. This will vary based on how you cut your pastry. I made 24 samosas from 2 pastry sheets and a pound of potatoes, and that’s after having a few tastes of the filling. If you have filling leftover, lucky you! Put it between 2 slices of bread with cheese and tomatoes, and turn it into an Indian grilled cheese sandwich.